Editor’s note: This story was originally published in 2013. At the Functional Orthopedic Research Center of Excellence Lab, or FORCE Lab, intern Jessica Postyeni places reflective sensors on the knees, ankles and feet of her client. She runs him through a series of exercises, and his movement is tracked using a state-of-the-art motion capture system. Later, Postyeni uses software to build a skeleton from the data and is able to analyze how the client is coming down on his heel, the angle of his knee and if he is at risk for injury. 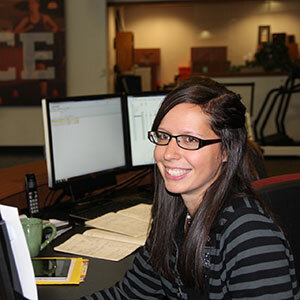 Postyeni, a senior studying Exercise and Sport Science (EXSS) in the College of Public Health and Human Sciences at OSU-Cascades, is one of the first interns to work in the FORCE lab, which opened in 2012. The FORCE Lab is a biomechanics laboratory that provides cutting-edge research and intervention strategies for injuries. FORCE lab intern Jessica Postyeni. Partners of the lab include OSU-Cascades, Therapeutic Associates–Bend Physical Therapy, The Center Orthopedic & Neurosurgical Care & Research and The Center Foundation. Christine Pollard, an associate professor in EXSS at OSU-Cascades, is the lab director. The lab is managed by OSU-Cascades instructor Andy Hayes, who is a bioengineer and physical therapist. OSU-Cascades Exercise and Sport Science students have the opportunity to intern at the FORCE lab. As one of the first interns, Postyeni has been laying the groundwork for those who follow. She’s been writing instructions for the data processing software, making therapeutic exercise videos for the lab website and working with a variety of clients—including young athletes looking to prevent injury and a 70 year-old man who is learning to walk more efficiently after a stroke. “It’s been exciting to see his progress,” said Postyeni. Under the supervision of physical therapists and lab staff, the interns study movement, identify inefficiencies and provide recommendations designed to decrease stress on the musculoskeletal structures in the body. They have access to the latest equipment, receive hands-on training in the research process and observe rehabilitation interventions in a clinical setting. In his role as manager of the FORCE Lab, Hayes said the interns’ contributions illustrated the benefits of having undergraduates in the lab. He also says that Postyeni had ample opportunities to put her stamp on the lab and routinely seized them. Postyeni knows a lot about the workings of the human body. In addition to her EXSS classes at OSU-Cascades, she is a certified yoga instructor and teaches classes at Juniper Swim and Fitness. She’s interned at the exercise physiology lab at Central Oregon Community College, the FORCE Lab, and will complete an internship in cardiac rehabilitation. After graduation, many EXSS students go on to earn advanced degrees. Postyeni wants to wait a few years before making any big decisions about graduate school. She’d like to be an athletic director at a fitness facility—designing fitness programs, teaching classes and running the center. Whatever she does, she wants to be active.